Fireside Furniture has Northeast New Jersey’s largest selection of made in America furniture displayed in fully appointed room settings. At Fireside Furniture we are proud to carry many of America’s top furniture suppliers of primarily Made in America amish, shaker, mission, country and rustic furniture. We do not sell our products over the internet or via mail order nor will we quote prices over the phone or online. Furniture must be seen in person to really understand what you are getting. The quality of the wood, finish, materials and construction must be seen and touched to understand and appreciate the purchase. And there’s just plain trying the furniture out to feel if a sofa fits you or the the dining room chairs are comfortable. 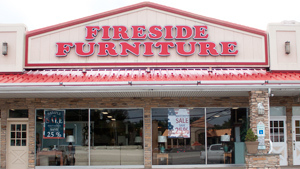 Fireside Furniture is located on New Jersey’s Route 23 South, one mile from exit 52A off I-287 . Directions. Fireside’s delivery and assembly service is second to none. Fireside Furniture trucks only transport new furniture. Our trucks never transport used bedding or used furniture. We deliver throughout the New York City Metro Area. Our furniture delivery area includes northern, central and western New Jersey, New York’s Hudson Valley and western Connecticut.